Remember my love of organization! Well, I’m nowhere near having a black belt in clutter karate, but every now and then I feel the need to clobber one corner of chaos. Here is the most recent area that needed fixing. My necklaces. 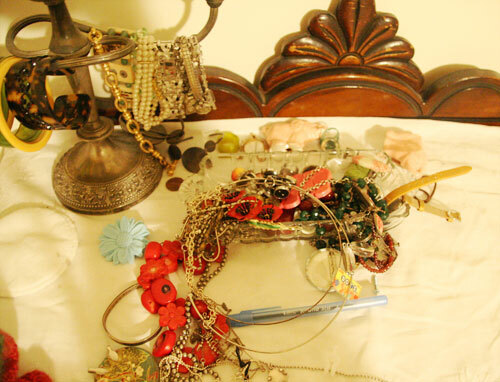 I am a person who needs to have my jewelry out because I forget about it otherwise. But it needs to be pretty at the same time. Here is what it looked like before, and it’s bad. people. I understand if you need to look away. Scary, right? Like it looks like everything is just tangled together…because it is. I needed a solution STAT. Well, STAT in my case was seven months. 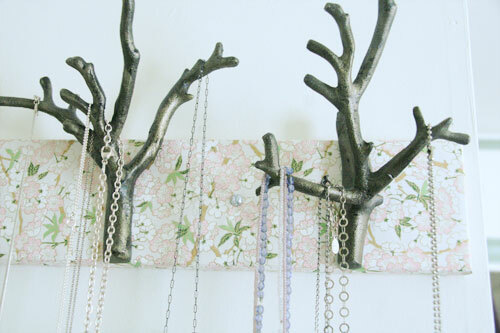 First, I bought the hooks from Urban Outfitters. And then I needed to stare at the boxes for a good three months before taking them out and trying to put on up directly on the wall only to make a hole the size of a quarter and get frustrated and wait another three months until my sweetie tried to put the hooks on a board, but he split the board. Then this project needed to sit again until my parents came out and three weeks past until my Dad was about to leave and I begged him to do this one project, which took him half a day to do after a couple of the hook backs broke. Phew! I need a drink just thinking about that! But I love the finished product. I covered the board some Japanese decorated paper I bought from Paper Source instead of painting it. I like the final outcome quite well. It was worth the wait. Oh, that’s gorgeous. I think the paper works really well with the twig hooks. I have to have my jewelry out where I can see it too, or it just never gets worn. 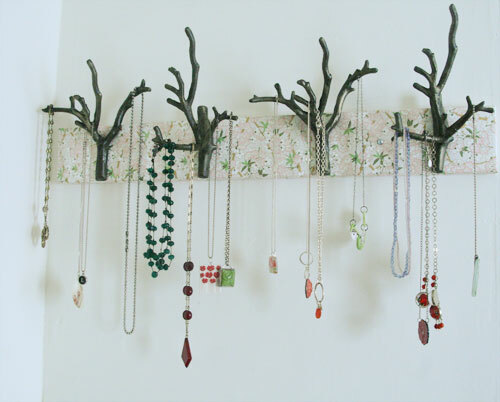 I’ve got a very plain jewelry tree though, very plain metal rods. Color me very jealous of yours. Pingback: April Canipe » » Creative Saturday!